Super Savings Item! Free Shipping Included! 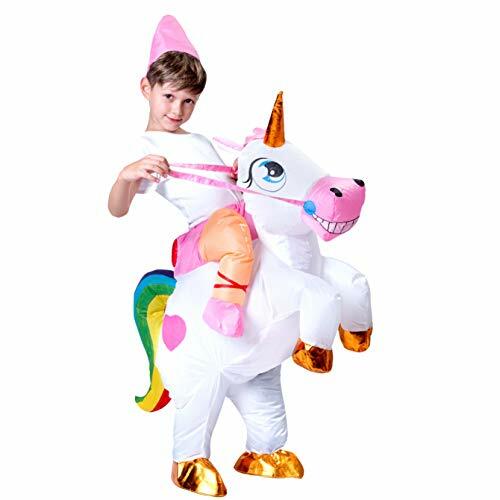 Save 31% on the Spooktacular Creations Inflatable Riding a Unicorn Air Blow-up Deluxe Costume - Child One Size Fits 4-8yr (42''-51'' Height) by Spooktacular Creations at GB Toys. MPN: 20023. Hurry! Limited time offer. Offer valid only while supplies last. Deluxe Version of Inflatable Unicorn Dress Costume. Child Size. One Size Fits 4-8yr old, 42''-51'' Height. Made with 100% Fire Resistant Polyester. Deluxe Version of Inflatable Unicorn Dress Costume. Child Size. One Size Fits 4-8yr old, 42"-51" Height. Made with 100% Fire Resistant Polyester. Deluxe Version of Inflatable Unicorn Dress Costume. Child Size (4-8 years old, 42"-51" Height). Made with 100% Fire Resistant Polyester.